Great Location at Tahlia rode,, very close to a pharmacy & many restaurants,, it takes max 7 min walking,, I went with my kids and they enjoyed the play room and the swimming pool. Great value for money. Friendly staff and good food. The room setup was great and comfortable. View is great and facilities as well. What I loved most is how private it felt, yes I’m in a hotel yet the feeling I got like I was renting my own luxurious studio in a facilitated building, it was my first time in any ascot hotels but definitely won’t b the last. P.S: I loved how clean and fresh the bed linens were. Lock in a great price for Ascott Tahlia Jeddah – rated 8 by recent guests! 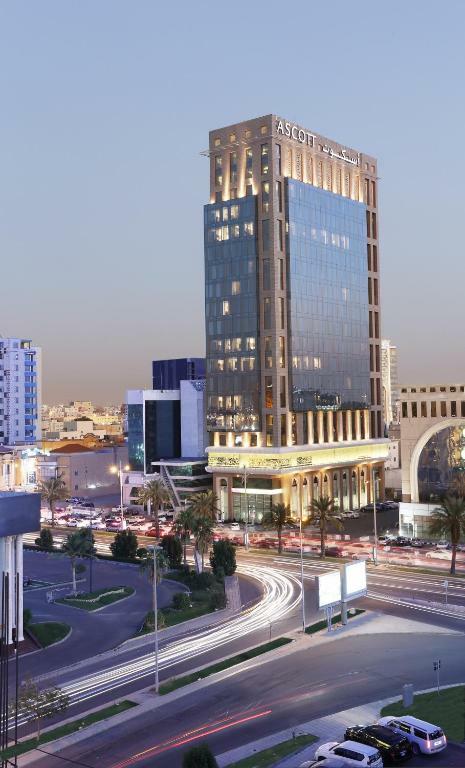 Ascott Tahlia Jeddah This rating is a reflection of how the property compares to the industry standard when it comes to price, facilities and services available. It's based on a self-evaluation by the property. Use this rating to help choose your stay! 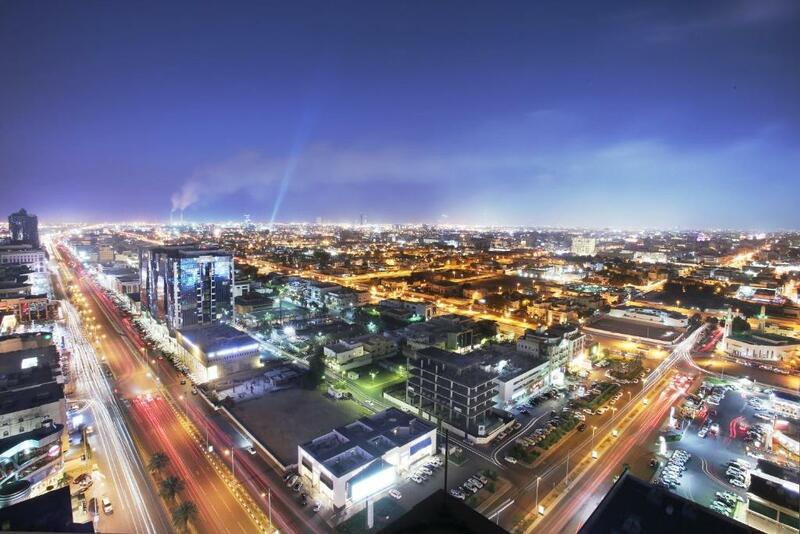 One of our top picks in Jeddah.Offering views of the city, Ascott Tahlia Jeddah is set in Jeddah in the Makkah Region, 1.4 mi from Jeddah Mall. An array of popular stores and shops are within walking distance from the property. All units have a flat-screen TV. All units are air conditioned and include a seating area. An oven is also provided, as well as a coffee machine and a kettle. Some units also have a kitchen or a kitchenette, equipped with a microwave. Towels are featured. 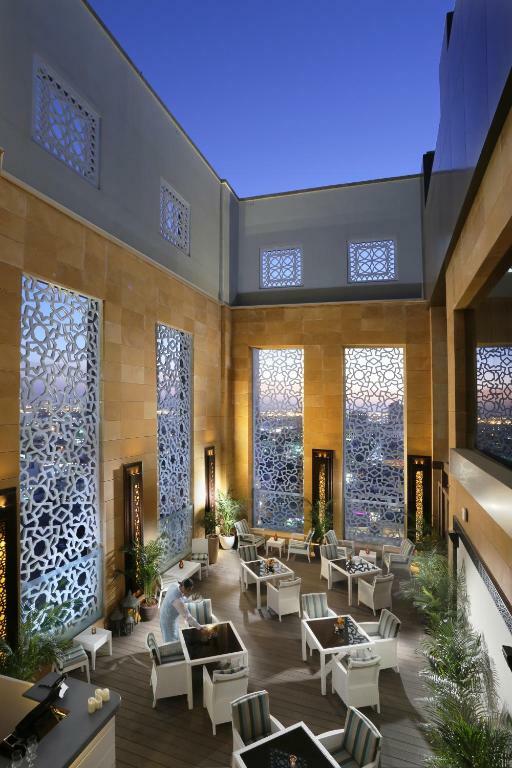 Guests can enjoy the on-site restaurant and a a rooftop lounge, Kenza's lounge (sheesha coffee), with an amazing city view. 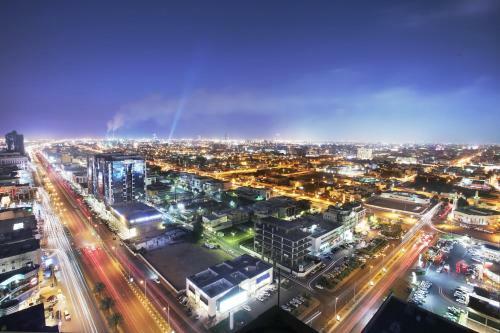 King Fahad Fountain is 3.1 mi from Ascott Tahlia Jeddah, while Al Shallal Theme Park is 3.7 mi away. 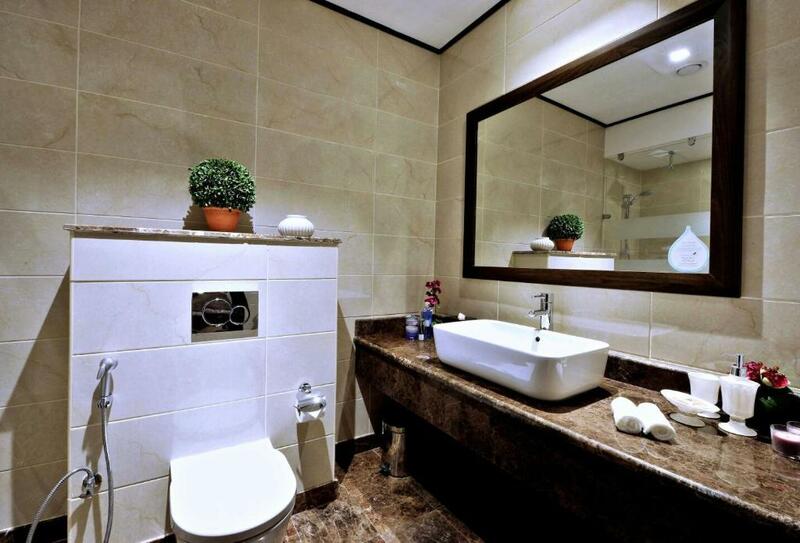 The nearest airport is King Abdulaziz Airport, 8.1 mi from the property. •Late check out till 16:00 half night and after 16:00 full night. •Complimentary breakfast for 6 people. •Complimentary breakfast for 4 people. The property is on the main avenue in Jeddah. 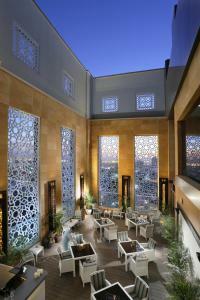 We can find a restaurant, a lounge with an amazing city view on Jeddah or a fully-equipped gymnasium. For business we can enjoy a meeting room. When I am staying in Ascott Tahlia I enjoy shopping in the malls or in the international shops that I find next to the property and drink a coffee in one of them. Coffee, restaurants, international shop and malls on the main avenue in Jeddah. 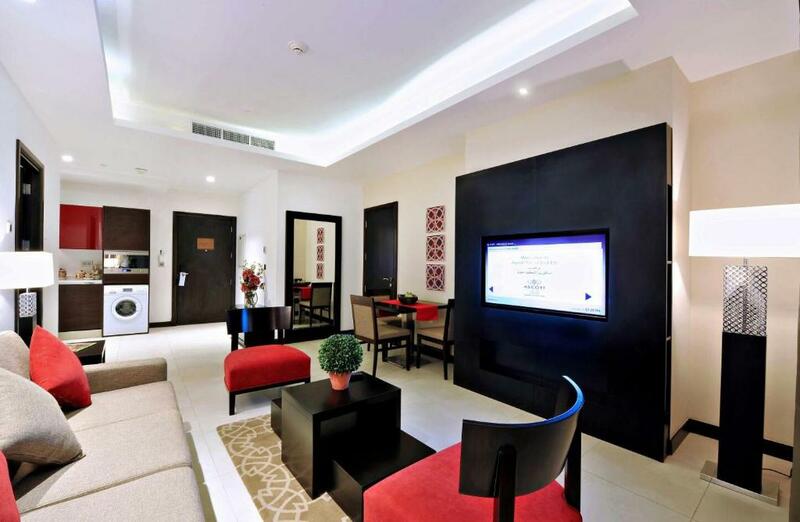 House Rules Ascott Tahlia Jeddah takes special requests – add in the next step! A SAR100 damage deposit is required on arrival (around USD26.67). This deposit will be fully refunded at check-out, as long as there isn't any damage to the property. 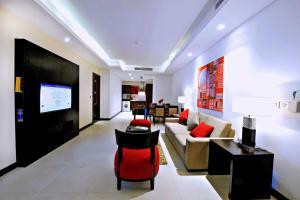 Ascott Tahlia Jeddah accepts these cards and reserves the right to temporarily hold an amount prior to arrival. 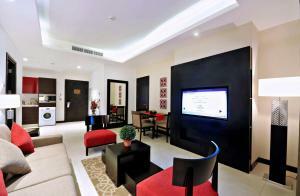 Please inform Ascott Tahlia Jeddah of your expected arrival time in advance. You can use the Special Requests box when booking, or contact the property directly using the contact details in your confirmation. A damage deposit of SAR 100 is required on arrival. That's about 26.67USD. This will be collected as a cash payment. You should be reimbursed on check-out. Your deposit will be refunded in full, in cash, subject to an inspection of the property. Great personnel who goes an extra mile for you. I felt very comfortable and welcomed in the hotel. Spacious rooms, clean and updated. No things except the smell of the cooking food coming from the nieghbors !